The mighty Dordogne river flows through some of the most scenic countryside in France, making this historic region a perennial favourite with UK holidaymakers. Whilst this landlocked territory lacks the allure of the sea, its rich heritage and glorious landscape more than make up for the absence of coastline. 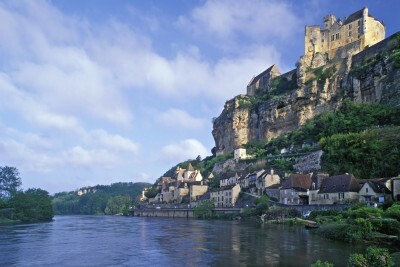 Though it lends its name to a local departement, the Dordogne is by no means the only river to twist and turn its way through this patchwork of fields, rolling, wooded hills and gorges, past towns and villages whose fairytale turrets tell of turbulent times past. Today, this rich history is revealed in ancient settlements such as Brantome, Sarlat, Domme and the regional capital Perigueux. Jewel in the crown is the Medieval pilgrimage site of Rocamadour, perched high on its pinnacle above the Alzou gorge. The underlying limestone rock makes for stunning scenery, particularly to the south where the rivers Lot and Cele have carved spectacular canyons down to their confluence near the pretty hill-top village of St-Cirq-Lapopie. Downstream, the much-photographed 14th-century Pont Valentre spans the River Lot an ancient point of entry to the fascinating city of Cahors, famous for its dark red wine. Below ground, prehistoric settlers have also left their mark throughout this region; the world-famous cave paintings of Lascaux, Les Eyzies and Peche-Merle should be on every visitor’s itinerary. Renowned for its fine architecture and good food, it is also still possible to ‘get away from it all’ in the Dordogne region which offers a great outdoors to explore whether on foot, by bicycle or canoe. Well-served by motorways, the region can also be accessed by high-speed train and air via France’s fourth-largest city, Toulouse, to the south , Bergerac and Bordeaux to the west.